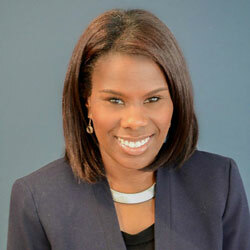 Melanie E. Bates, CIPP/US, is the Director of Communications at the Future of Privacy Forum. Melanie is responsible for all FPF communications requirements including website maintenance, media relations, internal member communications, and social media presence. She was previously the Director of Policy & Communications at the American Civil Liberties Union of the Nation’s Capital (ACLU-DC). Prior to ACLU-DC, she was the Legislative Director for Ward 6 Councilmember Tommy Wells at the Council of the District of Columbia. Melanie was the 2014-2015 President of the Greater Washington Area Chapter, Women’s Lawyers Division, National Bar Association (GWAC). She also served on the National Bar Association’s Board of Governors. Melanie is a graduate of the DC Bar Leadership Academy and the New Leaders Council Institute (NLC), Washington, DC Chapter. Melanie earned her Bachelor of Science in Marketing from Hampton University and her Juris Doctor from North Carolina Central University School of Law.